During that period one of my forefathers was the chief priest of Sri Kalinga Narthana Perumal and who bore witness to the divine life span of Sri Venkata Kavi at Sri Kalinga Narthana Perumal Temple. It was the practice of Sri Venkata Kavi to compose his songs after offering pradakshina to the Kalinga Narthana Perumal. Venkata Kavi very much craved in his mind to witness the divine bliss of selfless form of Lord Sri Krishna in person. Lord Sri Krishna has this uncanny virtue of not appearing before His devotee as craved by the devotee, there by testing the ultimate faith of him and in the end bless His devotee with His divine presence at the proper moment. Bearing witness to this, in spite of the staunch faith of Sri Venkata Kavi, Lord Sri Krishna did not bless Sri Venkata Kavi with His divine presence. Unflinched by this, Venkata Kavi reached the pinnacle of his staunch faith of the Lord by secluding himself from the rest of the world forsaking all the worldly desires including food. Due to his prolonged starving over many months, Venkata Kavi was reduced to skelton like form and there by found very difficult to perform his daily chore of pradakshina even a weebit. Slowly he began to loose his eye sight. Even when his life was ebbing out of him, unflinched by this and remaining deep routed in his staunch faith to the Lord, he decided to compose for the last time in praise of the Lord. The famous “Alaipayuthe …Kanna……” song is his last composure in mortal form. [It is my humble pleading to you to remember about his last breath when you listen to “Alaipayuthe..” song]. Even when his last composure of “Alaipayuthe..” neared its end Lord Sri Krishna did not appear before Venkata Kavi. Even when confronted by the ultimate truth of death, Venkata Kavi, undetered from his staunch faith in the Lord won over the fear of death and continued his singing in praise of Lord Sri Krishna. Lo and behold, the entire place was filled with the sweet aroma of the divine scent of Jawadh and Nagalinga flowers. The divine breeze that spread all over the place immersed Sri Venkata Kavi in divine bliss. At that moment he completely lost his eye sight and was not even able to utter a sound in praise of Lord. At this penultimate hour of his life, Sri Venkata Kavi felt the presence of a small child lying in his lap. Even after his repeated request he did not receive any reply from the child. In this penultimate hour, irritated by the non response of the child, Sri Venkata Kavi pushed the child from his lap. Immediately Venkata Kavi heard a sweet voice that proclaimed that the owner of that voice was the divine hero upon whom he has composed and sung all the songs in his life time. The divine voice wanted Venkata Kavi to see and recognize the owner of the voice as Lord Sri Krishna. To this, Venkata Kavi implored to the Lord by expressing his grief that when he was hale and healthy, Sri Krishna did not appear before him, but appeared before him when he was not even able to prostrate at the Lotus feet of Lord Sri Krishna. During this time, the life was slowly ebbing out of Venkata Kavi. As a result of his undeterred and staunch faith towards Lord Sri Krishna, Sri Venkata Kavi was blessed by the glory of merging his soul with the Lord. Thus Lord Sri Krishna took the divine soul of Venkata Kavi along with Him to His divine abode Vaikunta, where He in turn started worshipping the divine soul of Venkata Kavi with utmost devotion and thus granted the divine soul of Venkata Kavi, a place not even achieved by Kuchela, another stauch devotee of Lord Sri Krishna. Thus the invincible Lord Sri Krishna surrendered Himself to the divine soul of Sri Venkata Kavi and went on addressing the Venkata kavi as one of the foremost among His devotees. On seeing the enthusiasm with which Lord Sri Krishna worshipping His devotee, Rukmani and Sathyabhama, the two consorts of Lord Sri Krishna became astonished. At Vaikunta, when Lord Sri Krishna blessed Sri Venkata Kavi with any boon that he desires, Sri Venkata Kavi expressed his desire to go to Sri Kalinga Narthana Perumal Kovil once again and wanted Sri Krishna to dance to the tunes of his songs. 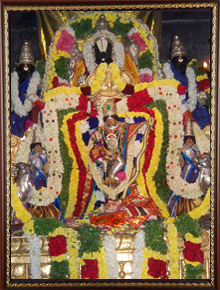 Thus Lord Sri Krishna and Venkata Kavi once again came to the Kalinga Narthana Perumal Temple, Oothukkadu. There, Lord Sri Krishna challenged Sri Venkata Kavi such that if Sri Venkata Kavi was not able to compose and sing to the various dancing postures of Lord Sri Krishna, he would turn into an idol. Thus at the behest of Sri Venkata Kavi, Lord Sri Krishna once again enacted the divine play of Kaliya Narthana. To the various dancing postures of Lord Sri Krishna, Sri Venkata Kavi started to sing his composure “Tham Theem Thanana Tham…….”. At one stage, Venkata Kavi was not able to compose to the dancing posture of Lord Sri Krishna. As per the challenge, Lord Sri Krishna turned into an idol in the dancing posture of Sri Kalinga Narthana Perumal. Sri Venkata Kavi, after accepting his defeat, worshipped the Lord to which Sri Krishna revealed to Sri Venkatasubba Iyer that he is none other than Sage Naradha and that he may go back to Vaikunta. Hearing this, Sri Venkatasubba Iyer wanted to know what Sri Krishna would be doing next. The Lord replied that throughout Kaliyuga Sri Krishna would be blessing His devotees who come to Oothukkadu as Sri Kalinga Narthana Perumal, thereby making Oothukkadu as Bhooloka Vaikunta. With folded hands, Sri Venkatasu bba Iyer implored to the Lord that instead of going back to Vaikunta, he would also like to make Oothukkadu temple as his abode. He further expressed his desire to continue singing in praise of the Lord, to which Sri Krishna granted him the boon. Every night to this day, Lord Sri Krishna as Sri Kalinga Narthana Perumal danced to the emelodies tones of Sri Venkatasubba Iyer, accompanied by His gopikas. Many people residing near the temple have heard the melodious sound of the padaswara eminating from the Lotus feet of Sri Kalinga Narthana Perumal at night. This is a testimony that Sri Kalinga Narthana Perumal along with Sri Venkatasubba Iyer, with His physical presence, has made Oothukkadu as Bhooloka Vaikunta. The entire clan of celestial devas also reside near the sanctrum sanctorum of the temple. As a result of the boon that Sri Venkatasubba Iyer obtained from Sri Kalinga Narthana Perumal, Sri Venkatasubba Iyer still continues to be the mediator between Sri Kalinga Narthana Perumal and His staunch devotees. Lord Sri Krishna continues to bless His devotees in that same dancing posture of Kalinga Narthana Perumal at Oothukkadu. There are several factors that throw light upon the fact that the Panchloha idol of Sri Kalinga Narthana Perumal is not made by a sculptor. 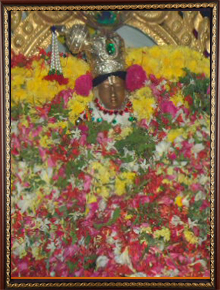 In the dancing posture of Sri Kalinga Narthana Perumal idol, the feet of the Lord do not touch the head of the serpent. There is a small gap between the sepent’s head and the left foot of the idol. 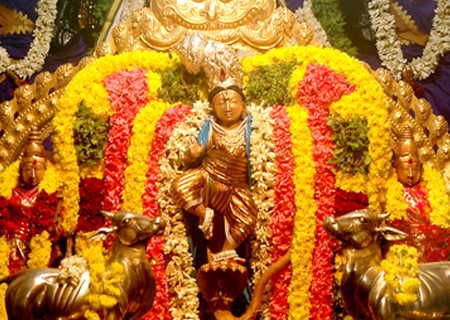 The right leg of the idol is in mid air. The left hand of the idol does not fully hold the serpent’s tail for support. The entire weight of the idol is supported upon a slight contact between the left thumb of Sri Kalinga Narthana Perumal idol and the serpent’s tail. The remaining four fingers are not touching the serpent’s tail. On a closer look, one can also find scars on the right leg of Lord Krishna, below the knee, formed due to the voilent beating of the Kaliya, the serpent with its tail. This is an extraordinary form of sculpture that is not possible with the skill of any sculptor. As Lord Sri Krishna in the avatar of Sri Kalinga Narthana Perumal has made Oothukkadu as his ‘Booloka Vaikundam’, the Gopika’s who always flock around Lord Sri Krishna, continue to visit Him every night at Oothukkadu temple. The sound eminating from the ‘padaswara’ of Lord Sri Krishna during every night holds testimony to this. The old man thus completed the true history about the origin of Oothukkadu temple, with laughter as he mentioned about the visit of Gopikas to Oothukkadu temple during every night.